Geeks around the world have fallen in love with Princess Leia's metal bikini, but we only saw her being pawed by Jabba the Hutt. Back in the 1980s they got to see a lot more of her in these vintage photos. We already featured one of these images in our post 15 Interesting Facts About the Slave Leia Costume, but some more images have been found. 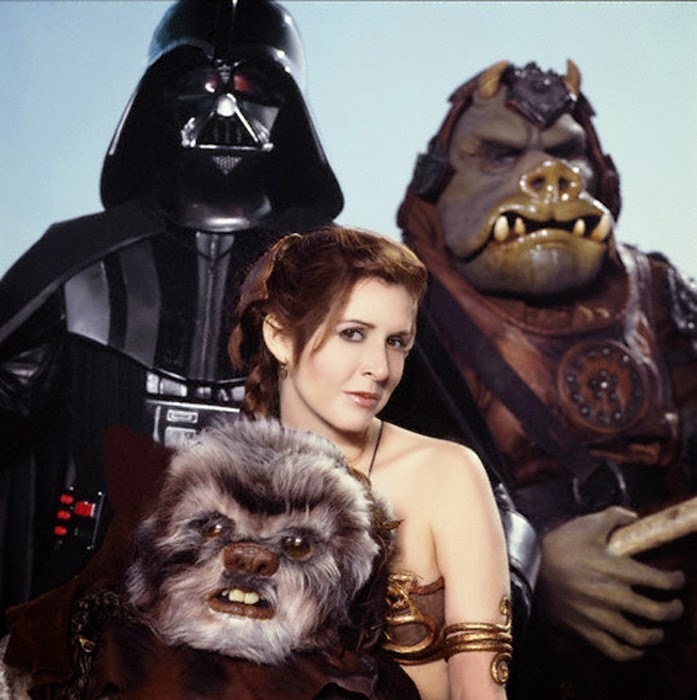 They're from a Rolling Stone photo shoot from 1983 promoting Return of the Jedi. Now, behold the glory of Slave Leia frolicking on the beach. It's great to see how much fun she has in the costume because we already know she hated wearing it in the movie. What do you think of these Carrie Fisher bikini pics? What's your favorite role by Carrie Fisher? I wonder if the Metal Bikini is rust proof? One thing you can say for Jabba the Hutt. He certainly had good taste. Impressive. Wasn't expecting her to look that attractive. I also wasn't expecting those images to be real. Rollo it took a lot of searching to make sure those are really her. With the make-up she looks a little different. Top photo is reversed, i.e. backwards.